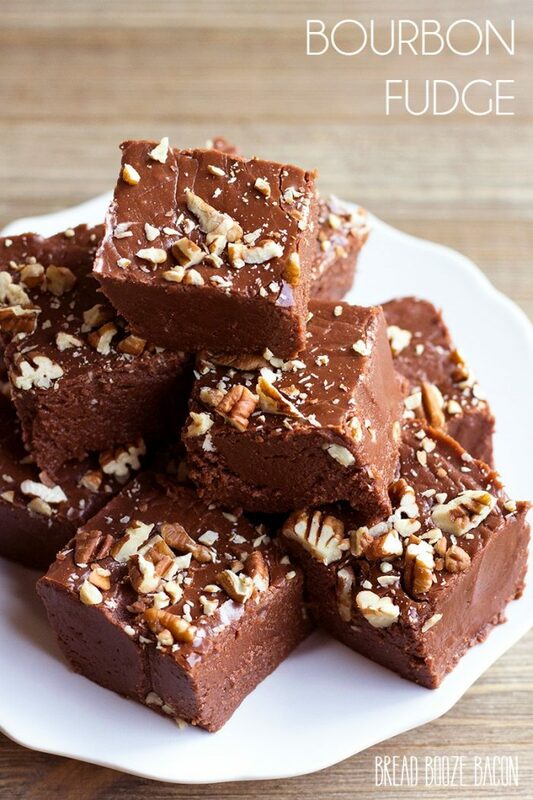 Satisfy your sweet tooth with this rich and decadent Bourbon Fudge! 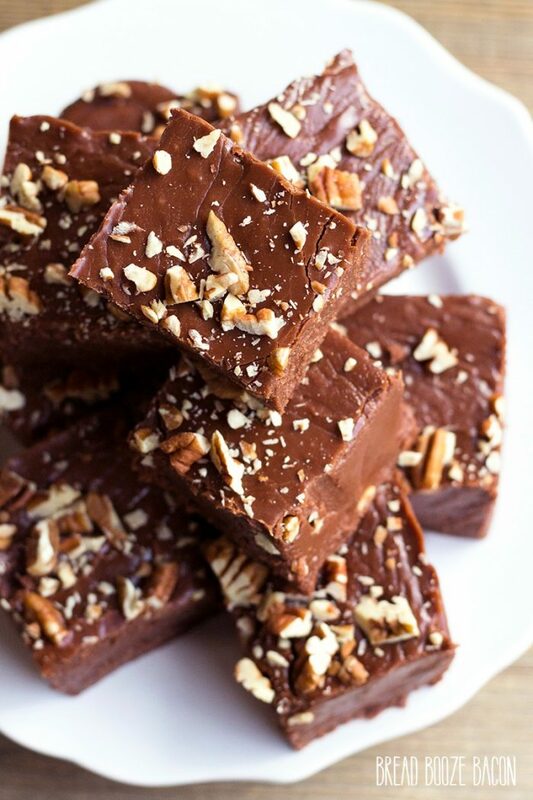 This easy stove-top fudge recipe will win over everyone that tries it! I wasn’t always a whiskey drinker if you can believe that. When I was in my early 20’s I was a vodka girl. While vodka is still fine and dandy, I’m a tried and true whiskey drinker now. I love all the rich caramel and vanilla flavors from the barrels (especially charred barrels), and aroma. Each one is special in its own way and I adore trying as many as I can get my hands. Now, not all whiskeys are for mixing and cooking with. Some are definitely for sipping. Mike snagged us a bottle of Pappy Van Winkle 12 year last month and holy cow! It’s heaven in a bottle guys. I’m normally a Tullamore D.E.W. 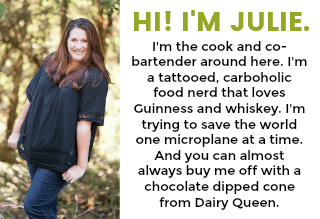 and Dr. Pepper girl, but the bourbons from the Buffalo Trace distillery are so good! I can drink the Buffalo Trace on the rocks and we have Pappy neat at my house. If you’re a whiskey lover and haven’t had any of these, get off your but and get to the liquor store! Let’s get to this fudge. This past fall I got to take a trip to Kentucky and see part of bourbon country. The little town my girlfriend and I stayed in had a big arts & crafts fair. We, of course, managed to find the stalls selling bourbon honey lemonade (which I’m still trying to replicate) and bourbon fudge. I’ve been dying to get my hands on more fudge, and today it the day! This fudge is rich, has a smooth mouthfeel that dissolves as you eat it, and the bourbon notes are wonderful. The only thing that could make it better is bourbon candied pecans on top! 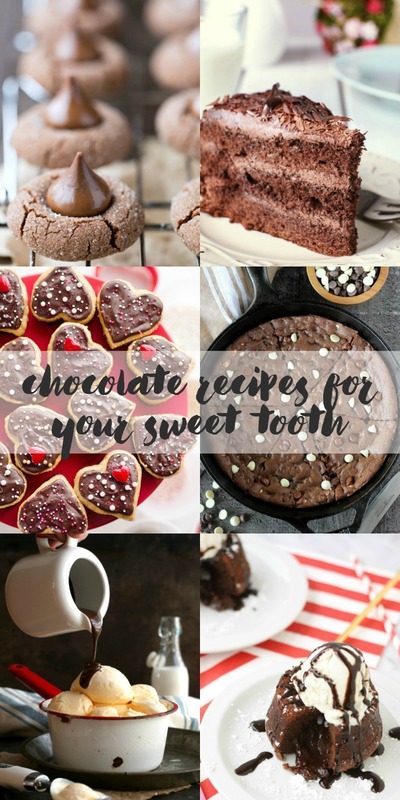 For all my chocolate lovers out there, you’re in luck. 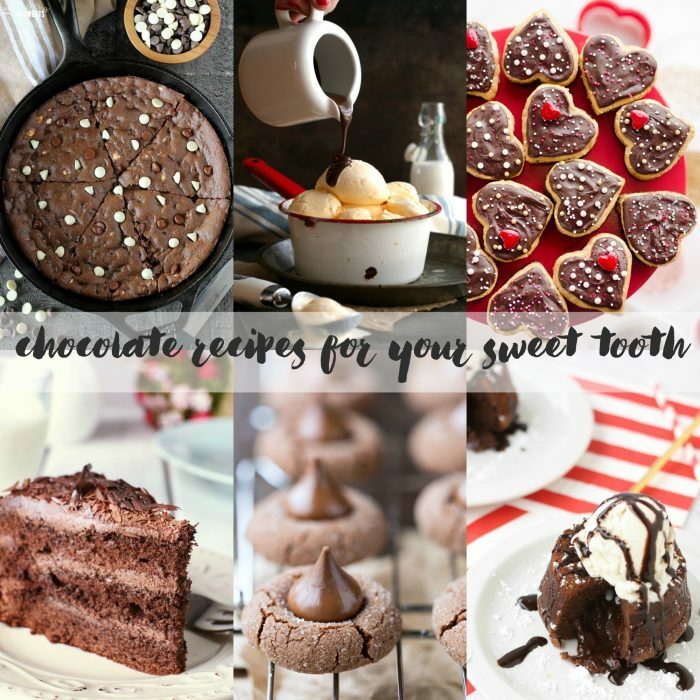 This month’s feast & devour is all about sweets for your sweet and indulging in chocolate every way you can dream it! To see all the recipes being shared today, click the linked recipe titles below. Espresso Chocolate Cake from Kleinworth & Co.
Brownie Chocolate Chip Cookie Dough Cake from Home.Made.Interest. Line a 9-inch by 9-inch baking sheet with foil. 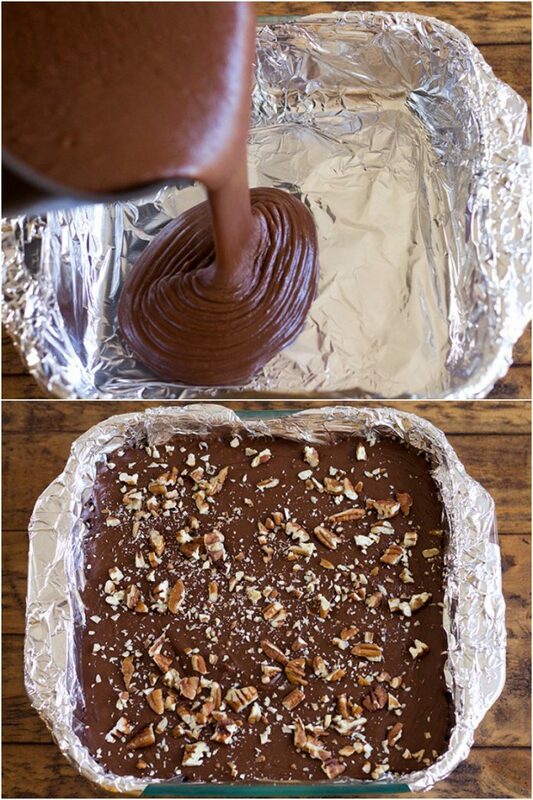 Be sure to let the foil hang over the edges so you can use it to lift the fudge out of the pan later. Place a medium-sized saucepan over medium-high heat. To the saucepan add the butter, evaporated milk, and sugar. Bring to a boil, stirring frequently to help make sure everything melts together. Cook for 4-5 minutes, or until a candy thermometer reach 235 degrees F (just under the "soft ball" phase). Be sure to stir constantly to prevent burning. Remove the saucepan from the burner and stir in the marshmallow fluff and chocolate chips until combined and smooth. The mixture will be thick. Pour in the vanilla and bourbon. Stir to combine. Be carefully not to stir too quickly or the liquids may splash. Pour the fudge into the prepared baking dish and shake gently so it spreads into an even layer. Sprinkle the pecans all over the top of the fudge, if desired. 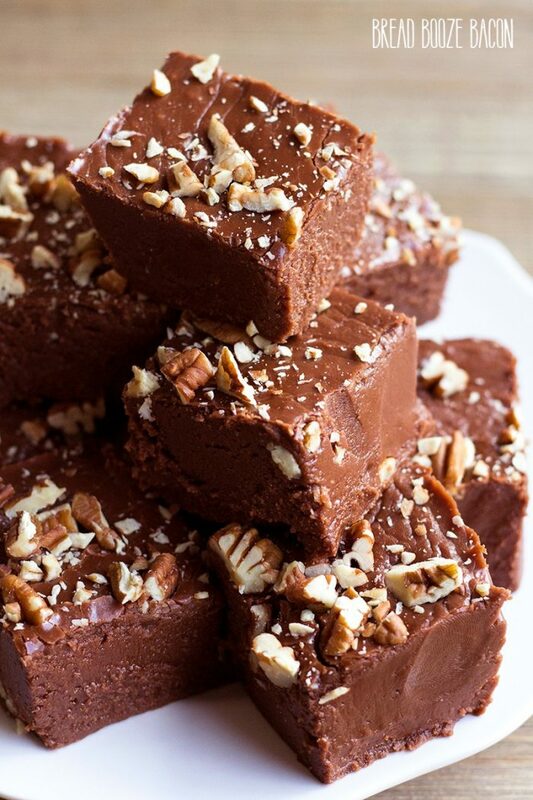 Leave the fudge to set up on your countertop for 3 to 4 hours. Use the foil to lift and fudge out of the baking dish and then gently pull the foil back from the fudge. Cut the fudge into pieces. 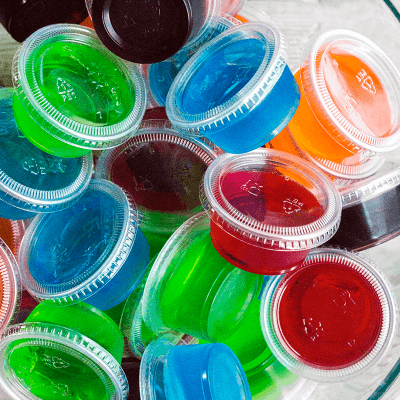 Store in an airtight container in the fridge (or on your counter) if not serving immediately. You can speed up the resting time by letting your fudge sit up in the fridge after the baking dish cools down a bit (about 1 hour or so). I don’t get marshmallow fluff where I live. What could be a substitute? If there isn’t a suitable one, can I skip the evaporated milk and marshmallow fluff and use condensed milk as substitute for both? I just realized then I would also need to adjust the amount of sugar so it doesn’t end up too sweet. Please advise. Thanks. Hi Seema! You could substitute 14 ounces sweetened condensed milk and 12 ounces semi-sweet chocolate chips. Place both in a microwave safe bowl and heat for 1 minute. Let sit for 1 minute then stir until smooth. Heat for 30 seconds more if needed and stir again. Then add the vanilla, bourbon, and pecans and continue on with the recipe as directed. Hope this helps! If using glass baking dish do i still line with foil? Yes. That way you can pull the fudge out of the pan to cut it.